An aquamanile is a vessel used used during Mass or at the secular table for washing hands. These ewers were very popular in the medieval period and took forms such as lions, knights on horseback, dragons and birds (in Latin the word aqua means water and manus means hand). This aquamanile is expertly crafted. In the skill of the design, such as the detail of the lion's mane and the beautifully depicted dragon handle, it can be regarded as a forerunner of the Renaissance small bronze, which was designed to be appreciated from all sides. This piece bears a close similarity to the large bronze lion cast for Henry the Lion (1129-1195), Duke of Brunswick in 1166. It has closer stylistic similarities to the lion head on the symbol of John the Evangelist on the font in Hildesheim Cathedral, cast around 1215-20. It is likely that both the font and the aquamanile were cast at Hildesheim around this time. 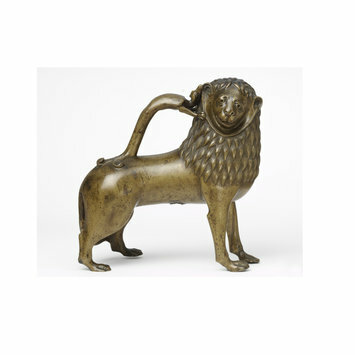 Aquamanile of copper alloy in the form of a standing lion with a full mane. His head turns to one side and he holds his tail between his legs. The handle takes the form of dragon, clinging to the beast's back. Water was filled though a small hole covered with a lid at the top of the lion's head and poured using a spout behind the left ear of the beast. The spout has subsequently been removed and the hole filled in. This vessel was cast using the lost wax method (cire-perdue). This aquamanile (vessel for washing hands) was probably made in a bronze casting workshop at Hildesheim, Germany. It is one of the best and most expertly crafted of its kind. 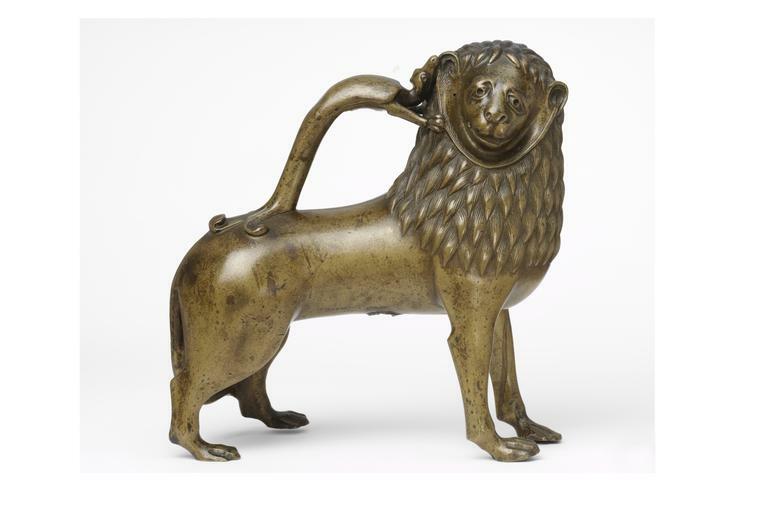 In the skill of the design, such as the detail of the lion's mane and the beautifully depicted dragon handle, it can be regarded as a forerunner of the Renaissance small bronze, which was designed to be appreciated from all sides. This example bears a close similarity to the large bronze lion cast for Henry the Lion (1129-1195), Duke of Brunswick in 1166. It shares even closer stylistic similarities with the head of a lion (symbol of John the Evangelist) on the font in Hildesheim Cathedral, cast around 1215-20. It is likely that both the font and the aquamanile were cast at Hildesheim around this time. The early owners of this aquamanile are unknown. In the nineteenth century the South Kensington Museum acquired it in Rome from Cav. Attilo Simonetti, for £28 1s. (see the Central Inventory, p. 10; also RP/1894/2320 and the Simonetti file). Note on acquisition says 'portion detached and other portion missing'. It is not certain to which parts of the object this note refers. The aquamanile was lent to the 'Church and Table Exhibition', for which see Registered File 2005/738. An aquamanile (aqua= water, manus=hand), is a vessel used for washing hands. These ewers were very popular in the medieval period and took forms such as lions, knights on horseback, dragons and birds. Aquamaniles were used during the mass or at the secular table.This aquamanile, despite its stylistic similarities to a bronze font in Hildesheim Cathedral, was a secular object. It would have been used by a wealthy person at the dinner table and it was probably an object to be admired by guests. Barnet, Peter and Pete Dandridge, eds. 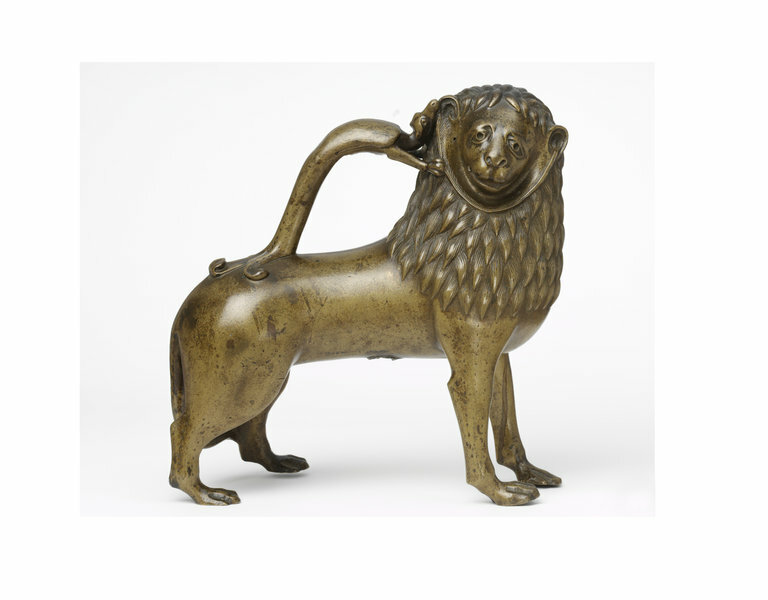 Lions, Dragons, & Other Beasts: Aquamanilia of the Middle Ages, Vessels for Church and Table. New York: Bard Graduate Center, 2006.